Boxed kit with unfinished pine handrail and silver effect end caps and wall brackets. Includes everything you require to achieve a straight run of up to 3.6 metres. 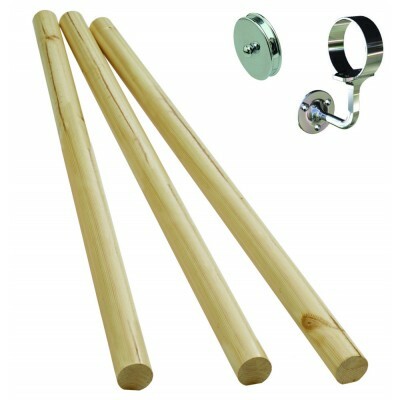 The wall brackets connect the lengths of handrail together, concealing the joint. In the box are 3 lengths of pine handrail, 4 wall brackets, 2 end caps and the appropriate fixing screws. (Wall plugs are not supplied, as not every wall construction is the same.) You will need to apply a finish of your choice (wood stain, oil, varnish etc) to the handrail. Complete with fitting instructions.